Fully adjustable Choker on Gold Plated Figure Eight Chain with Gold Plated Hook. Gorgeous antique Venetian Glass handmade "Wedding Cake" bead with original beadcaps. Sapphire glass oval faceted 'Cathedral' bead with bronzed ends. Vintage pink German Lucite 'crackle' bead. Vintage Swarovski Light Rose/Aurora Borealis Crystal. Vintage Gold Plated clam shell. Vintage Swarovski Topaz/Aurum disc Crystal. Vintage pale pink German Lucite faceted opaque bead. Vintage Gold Plated hammered rounds (2). Vintage German glass rose 'Givre' leaves. Antique Venetian Glass handmade round with rose 'drizzles' and silver foil inclusion. Luminous pearly round glass 'Givre' beads with pale blue inclusions (4). Vintage glass faceted rose 'Givre' bead. Vintage Light sapphire/Aurora Borealis Crystal. 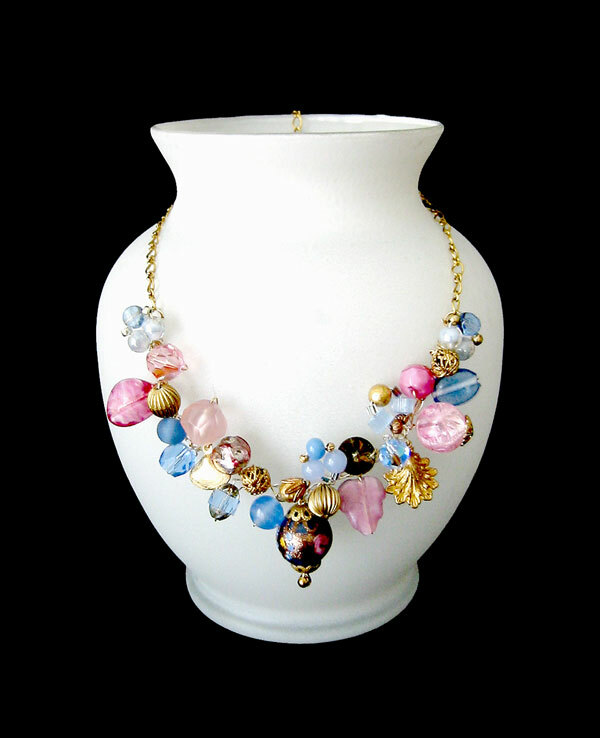 A variety of vintage glass and Lucite blue beads.